Startup team members test the control system in the Analytical Laboratory. 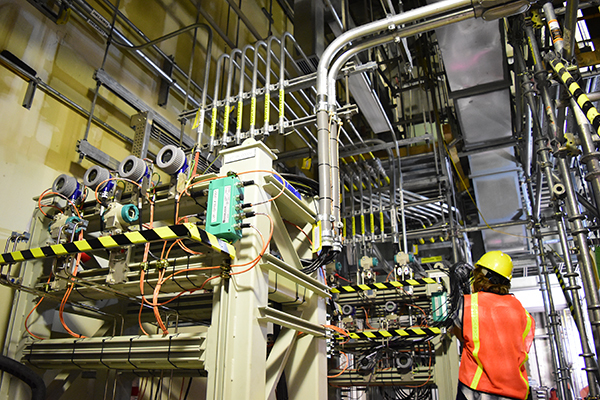 Employees at the Hanford Vit Plant have begun startup testing at the Low-Activity Waste (LAW) Facility and the Analytical Laboratory, marking the next step forward in commissioning. Nonradioactive Liquid Waste Disposal (NLD) System of sumps, pumps, pipes, valves, and instruments. The parts are generally in the basement, and include the system’s largest single component, an 18,000-gallon vessel. The NLD also includes floor drains and heating, ventilation, and air conditioning condensate drains throughout the building. Distributed Control System (DCS), consisting of sensors that monitor fluid levels, pressures, temperatures, and flow rates everywhere in the LAW Facility. Testing has begun on the first two floors. Electrical Motor Control Centers (MCC), including breakers, switches, and power supplies. Testing has begun on the basement and the first floor, as well as Building 24 switchgear. 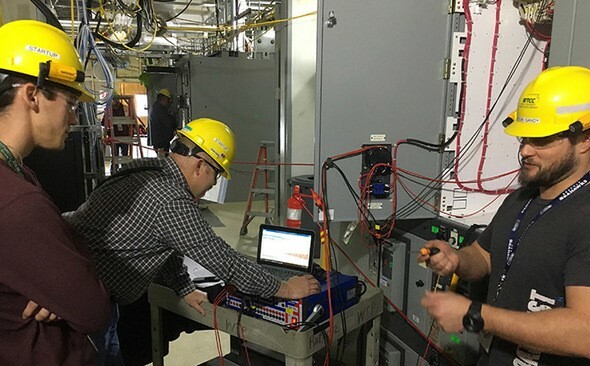 Startup personnel also began testing on the Analytical Laboratory’s DCS and MCC systems adjacent to the test engineers work station, which includes the temporary control and monitoring room for all testing on the project. Previous startup testing has focused on an extensive array of process support infrastructure called the plant’s Balance of Facilities (BOF). Read more about this important progress at http://bit.ly/2EZwynR. 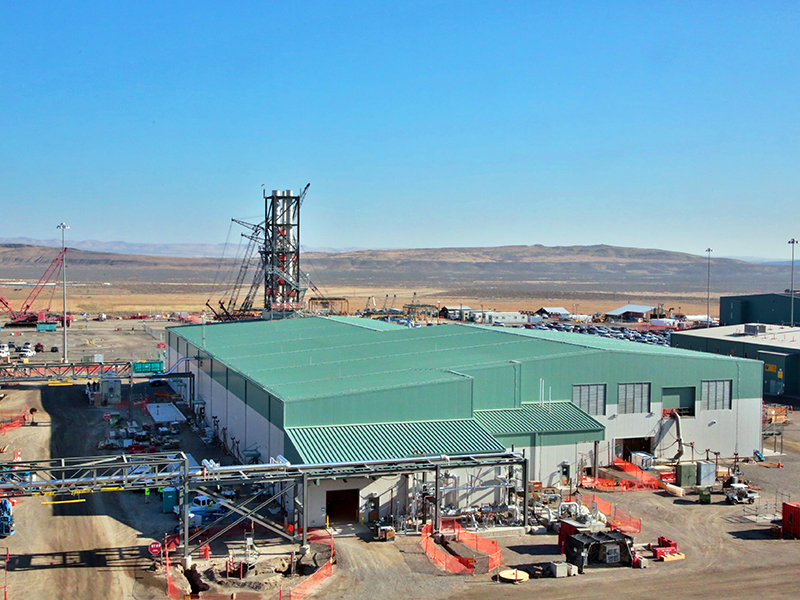 The successful procurement spending supported the positive progress made with continued construction and startup efforts for the Direct Feed Low-Activity Waste vitrification approach. Total procurement spending tallied $211 million at the Vit Plant during Fiscal Year 2017. Of the $211 million, 60 percent or $126 million was spent in Washington state and Oregon with $94 million of that in the Tri-Cities, where the Vit Plant is based. Local businesses provided goods and services such as safety supplies, small tools, electrical supplies, and vehicle maintenance. Since Bechtel began construction of the Vit Plant, it has spent more than $4 billion in goods and services with companies across the United States. Of that, $1.94 billion has been in Washington and Oregon, with $1.36 billion in the Tri-Cities. Read more about the Vit Plant's procurement impacts at http://bit.ly/2DZvH69. A worker looks upwards at the Low-Activity Waste (LAW) vitrification facility’s complex infrastructure of electrical raceway, cables, and wiring. 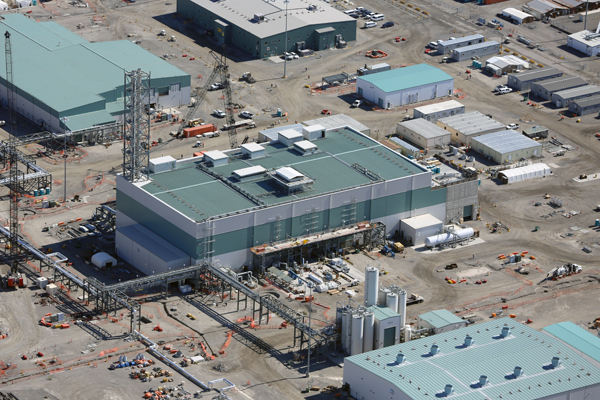 Construction crews completed a contract milestone for electrical work in the Low-Activity Waste (LAW) Facility. The contract milestone, called ‘bulk cable electrical installations,’ was completed nearly four months ahead of schedule. Completion of this milestone is a major step toward completing full construction of the LAW Facility structure. “This milestone sets the stage for our workforce to meet the LAW physical plant complete contract milestone of June 2018,” said Brian Reilly, Bechtel's project director at the Vit Plant. The LAW Facility includes more than 1.1 million linear feet of electrical raceway, cables, and wiring. That’s enough combined electrical infrastructure to span 840 laps around an Olympic-sized track or about 210 miles. Read more about this milestone accomplishment at http://bit.ly/2Ga1sdw. 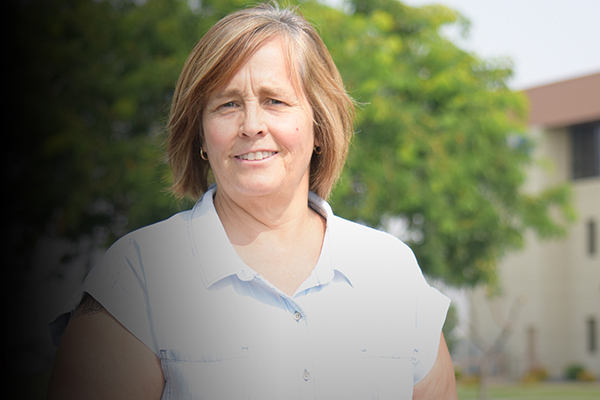 Read more about Toni and other Vit Plant employees at http://bit.ly/2AqXMzX. 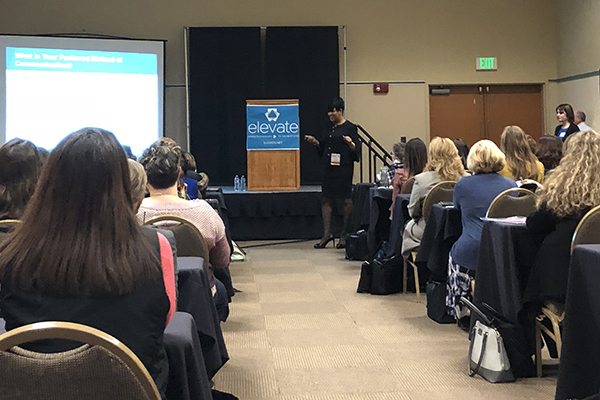 Lisa Armstrong, Bechtel's manager of Human Resources at the Vit Plant, presented at the Women in Business Conference 2018 in Kennewick. Her interactive presentation, titled "Communicating Effectively Across Generations - What do you bring to the mix? ", addressed the five different generations in the workplace and how effective communication between generations is key to teamwork. The Analytical Laboratory contains 35,000 feet of piping for drainage and waste transfer. Piping may be above ground, within underground cells and vaults, or embedded in the thick concrete foundation. All process piping is nuclear-grade stainless steel or Hastelloy and is installed to exacting specifications using the most advanced welding and installation techniques. Vitrification is a proven and reliable technology used at U.S. and foreign defense waste processing facilities. The first-of-a-kind challenge for the Vit Plant is to vitrify waste that is extraordinarily complex. The material consists of solids, semi-solids, liquids, and gases. In addition to water-like liquids, Hanford’s underground tanks contain saltcake, a material with the consistency of wet beach sand, and sludges. Also inside are wastes resembling peanut butter, small broken icebergs, foam, and whitish crystals. 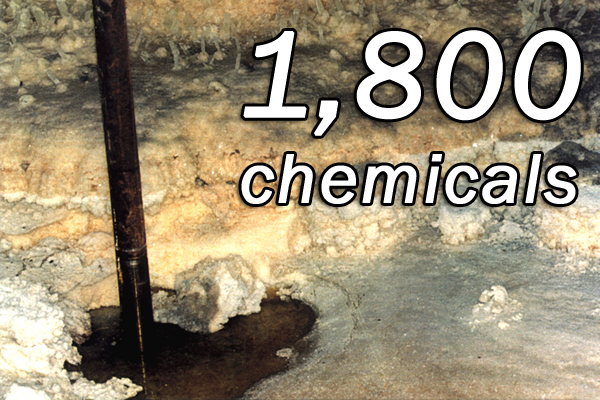 More than 1,800 chemicals have been identified in the tank waste, each containing varying amounts of toxicity and radiation. 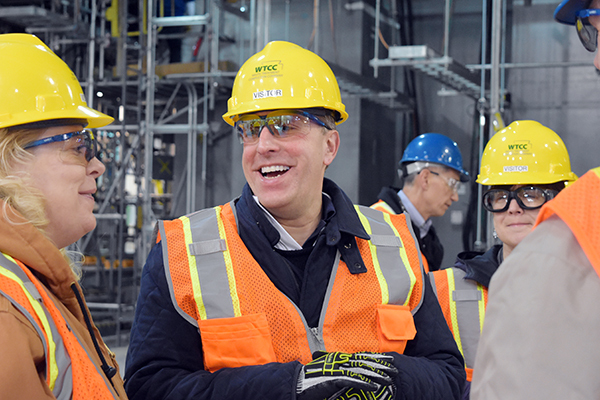 DOE Under Secretary for Science Paul Dabbar visited the Vit Plant jobsite as part of a recent tour of the Hanford Site. Dabbar leads the Department’s environmental and legacy management missions, in addition to being the principal advisor on fundamental energy research, energy technologies, and science. At the Vit Plant, Dabbar discussed the status of construction and transition to startup. “I was encouraged by the progress at the plant and how many of the systems and facilities needed to begin low-activity waste treatment are ready for startup,” he said. Read more about his visit at http://bit.ly/2srYYV1. Copyright © February 2018 Bechtel National, Inc., All rights reserved.